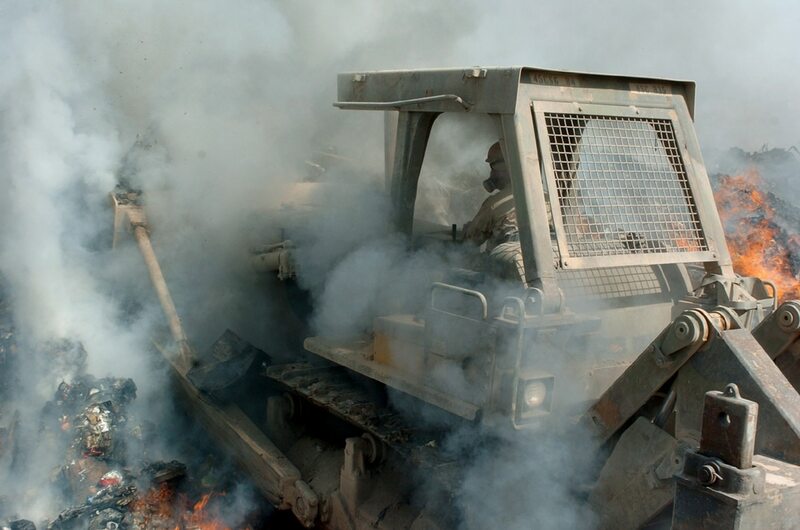 Troops who worked at burn pits in Iraq and Afghanistan, as well as those exposed to multiple dust storms during war-zone deployments, have higher rates of common respiratory illnesses like asthma and emphysema, as well as rare lung disorders, according to data drawn from the Veterans Affairs Airborne Hazards and Open Burn Pit Registry. Service members who experienced frequent exposures to dust and burn pits also report increased health problems like insomnia and high blood pressure. But they don't appear to have higher rates of cancer when compared with troops who deployed but had little or no such exposure, according to a new Department of Veterans Affairs Department report. The findings, in a report posted online by VA in June, are based on questionnaires completed by more than 28,000 veterans. The database allows any former service members who think they were exposed to fumes from burn pits or other sources of pollutants, such as sandstorms or dust, to register their health concerns with VA.
Nearly 46,000 veterans have opened accounts with the registry, with about 60 percent fully completing the questionnaire as of Dec. 31, 2014. Of those who finished the lengthy questionnaire, 27,378 said they were exposed to burn pits, and 24,782 said they had dust storm exposure at some point during deployment. According to the report, 30 percent of participants who said they were exposed to burn pits say they've been diagnosed with respiratory diseases other than allergies, with chronic obstructive pulmonary disease, emphysema and chronic bronchitis topping the list. High blood pressure was diagnosed in about one-third of personnel who reported burn-pit exposure and one-third who said they were exposed to dust storms. Those in both the burn pit and the dust storm exposure groups also reported higher rates of insomnia, liver conditions, chronic multisymptom illnesses and decreased physical function, such as walking, running or climbing steps. Significantly, 365 veterans said they've been diagnosed with either constrictive bronchiolitis or idiopathic pulmonary fibrosis — rare, crippling and often fatal diseases not usually found in young, relatively healthy populations like active-duty military personnel. A number of former troops, including some who were exposed to a sulfur mine fire in Mosul, Iraq, in 2003, have been diagnosed with constrictive bronchiolitis, but that diagnosis has been controversial, largely because its confirmation involves an invasive lung biopsy procedure that military and VA physicians say is not necessary in the absence of notable symptoms or a known exposure to something like mine fire. Dr. Paul Ciminera, director of VA’s Post-9/11 Era Environmental Health Program, said the latest report provides insight into the illnesses some veterans are experiencing. But he cautioned that the results do not mean that exposure to burn pits or dust caused the diseases. It also does not provide any information to determine whether those who signed up — mainly those who may have health consequences related to deployments — are experiencing illnesses at rates higher than their deploying and nondeploying peers, Ciminera said. "The registry is a hypothesis-generating capability," he said. "It could clue us in to the areas that need further study, but it's not going to be definitive to be able to say say, 'Yes or no, a particular exposure caused this or that disease.' "
But Steven Coughlin, former senior epidemiologist in the VA Office of Public Health, said the number of people reporting constrictive bronchiolitis or idiopathic pulmonary fibrosis warrant immediate additional study. A total of 309 individuals have reported constrictive bronchiolitis to VA, which Coughlin called "a sizable number." "In my view, the VA Office of Public Health should immediately conduct a case control study of these rare and potentially fatal pulmonary conditions to find out why they are occurring," he said. Troops and veterans began raising concerns over the health consequences of burn pits in 2008, when many began reporting respiratory ailments and illnesses they thought may be linked to the air quality of their working environments in Iraq and Afghanistan, where open-air burn pits were used to dispose of trash, medical waste and plastics. Defense Department officials said that while there was a slight risk for some, the risk for the broader population related to burn pits was low. But Military Times reported in 2008 that as far back as 2006, Air Force Lt. Col. Darrin Curtis wrote that the burn pit at Joint Base Balad, Iraq, presented an acute health hazard for individuals, and added: "There is also the possibility for chronic health hazards associated with the smoke." In 2011, VA and DoD asked the Institute of Medicine to determine whether health concerns could be related to burn pit exposure in Iraq and Afghanistan. The IOM found there was not enough evidence to determine whether the pits were directly responsible for harming the health of U.S. troops. The IOM report also said particulate matter and metals found in the dust of Iraq and Afghanistan may have contributed to the long-term health consequences for troops, but added that the data on that concern also is limited. The controversy sparked veterans advocacy groups like Burn Pits 360 and the Sgt. Sullivan Center to push for creation of the burn pit registry. Congress approved the registry in late 2012, and it began enrolling participants in June 2014. But those pressing for more information on dust- and burn pit- and dust-related illnesses and injuries remain unsatisfied. Daniel Sullivan, president and CEO of the Sgt. Sullivan Center, said more should be done to make veterans aware of the registry and allow them — or their families — to list symptoms and other diagnoses in the registry. "Many of the families who look to this registry for hope, including my own, have lost a loved one. Enabling us to report deaths would further the scientific purpose of the registry and also help us participate," Sullivan, whose son, Marine Sgt. Thomas Sullivan, died in 2009 of an unexplained illness, wrote in a letter to scientists reviewing the registry program. Sullivan and researchers also have reservations about question the questionnaire's scientific rigor and maintain concerns over the number of questions on smoking, as well as the omission of conditions and symptoms such as sleep apnea and atrial fibrillation, which many Iraq and Afghanistan veterans report having. "It appears that many of the questions were posed by researchers who were not [in Iraq or Afghanistan] and do not have a full understanding of the environmental exposures in the area," Navy Capt. Mark Lyles, a professor at the U.S. Naval War College, said. "In my view, the questionnaire doesn't have enough explanation for its questions," he said. "It should contain a paragraph explaining what a burn pit is. And what about the dust? The dust is there every day, whether there is a storm or not. We are dealing with occupations where personnel have to lay in the dirt and are exposed. There doesn't have to be a storm." Lyles stressed that his opinions are his own, and not those of the Navy or the War Ccollege. Ciminera described the questionnaire as a work in progress that may be altered based on the findings of an IOM ad hoc committee, which VA has contracted to evaluate the questionnaire and provide recommendations on collecting, maintaining and monitoring the information. "We look forward to the recommendations from them and others to improve it," Ciminera said. "We really need to know what the utility of some of these questions are. Hopefully, we'll get that data and hone in what we need to do to move forward." The most recent registry report found that 23 percent in the burn pit exposure group and 23 percent in the dust storm group said they had no respiratory conditions before deployment but did receive a diagnosis for one after deployment. Similarly, 34 percent of those exposed to burn puts and the same percent of those exposed to dust developed a post-deployment cardiovascular disorder, with most having hypertension. The registry does not indicate that the groups have high rates of cancer. According to the data, 6 percent of participants reported being diagnosed with some type of cancer, while 4 percent saying they had nonmelanoma skin cancer. The disease was no more prevalent among those exposed to burn pits or dust storms than among those who were not. The registry is open to service members who served in the Iraq and Afghanistan wars, in Djibouti after Sept. 11, 2001, or in the 1991 Persian Gulf War. The questionnaire takes about 40 minutes or longer to complete, VA says. According to the first report based on the registry data released in April, nearly 66 percent of those in the registry are enrolled in VA health care.